Generali Group’s Historical Archives provide inventory and reference services for research purposes, while awareness of its resources is promoted through the publication of books and articles, participation in exhibitions and conferences, scientific support to archival associations and guided visits for internal Group delegations and external visitors, including schools and universities. 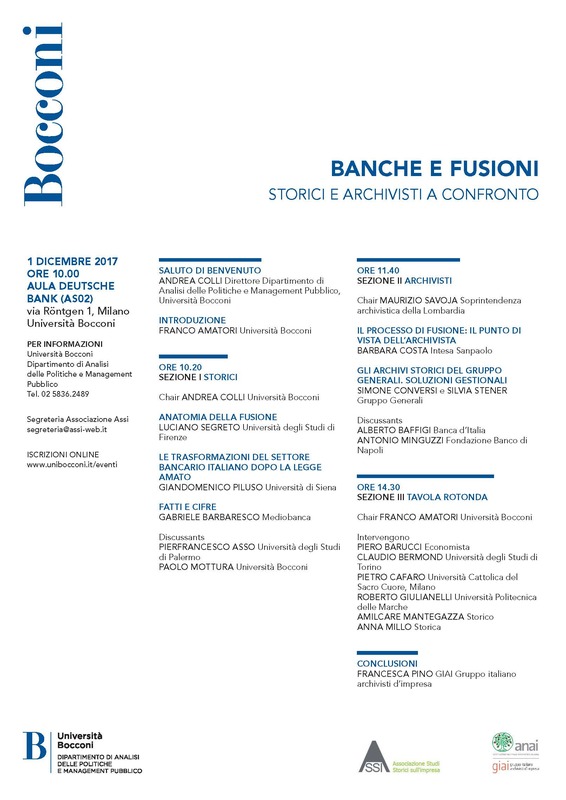 On 1 December 2017, speakers from Generali Group’s Historical Archives attended a conference on the historical aspects of bank mergers at Milan’s Bocconi University (Banche e fusioni, storici e archivisti a confronto [Banks and Mergers: Historians and Archivists in Debate]), organised by the Department of Policy Analysis and Public Management in conjunction with two associations of business historians and archivists, ASSI and GIAI. Generali has been a member of the working group on business archives of the Italian national archival association (ANAI) since its establishment in 2014, participating energetically in its various activities. The presentation, entitled Gli Archivi Storici del Gruppo Generali. Soluzioni gestionali [Generali Group’s Historical Archives. Management Solutions] covered the organisation of the Archives and described the common features and the dissimilarities of current projects for the description, publication and promotion of the archival resources. On 14 December, at Rome’s Sapienza University, speakers from the Generali Historical Archive discussed the publication Generali in History: Tales from the Archive at a training course entitled Valorizzazione e Comunicazione dell’Heritage per le Imprese e le Organizzazioni [Enhancement and Communication of Heritage for Companies and Organisations], promoted by the Faculty of Political Science, Sociology and Communication in conjunction with the Archival Authority of Lazio and Museimpresa, an Italian business museums association.